Taking an occasional yoga or meditation class? According to Buddhist teacher and psychotherapist Miles Neale, if you really want to achieve your full potential, there is so much more to discover about spirituality. He opposes what he calls ‘McMindfulness’, and advocates lifelong learning. It strikes Miles Neale how many people are seeking refuge in new, secular forms of spirituality. Unlike fifteen -let alone thirty- years ago, mindfulness, meditation and yoga are accessible to everyone now. You can take a yoga class at the gym, or do a YouTube meditation that only takes a few minutes. You ask if there’s anything wrong with that? Well, there is, according to Miles, who’s a psychotherapist and Buddhist psychologist teacher. He named the fast, easy forms of spirituality ‘McMindfulness’ – yes, inspired by the fast food chain. Miles, a friendly, open guy, tells all about it through Skype. ‘The thing is: in our western world, it often seems like mindfulness is a panacea to cure all our modern maladies. But mindfulness is only one of the pillars of the Buddhist path to freedom. The other two are virtuous activities and the wisdom of interconnectivity. Mindfulness practice, to develop awareness, is a good start, but it’s not enough. ‘We have to develop a more accurate worldview that appreciates how we are all connected and then live more harmoniously with each other and the planet’, says Miles. To him, McMindfulness means spirituality as a ‘quick fix’, that instantly makes you feel better. In the moment, it’s fine, but what does it bring in the long term, especially for our societies and the environment? ‘Life isn’t always fun, and growth doesn’t always come fast. Some processes take years, and growth continues throughout your life.’ He knows what he’s talking about. 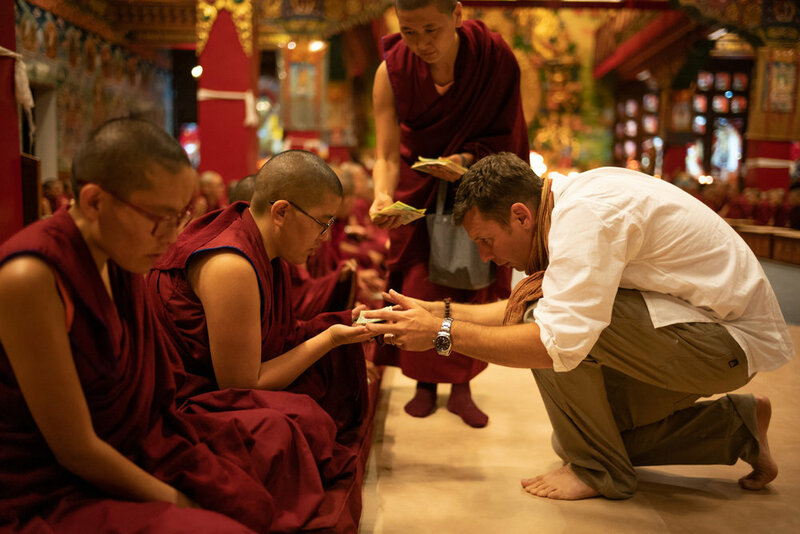 Miles has been studying Tibetan Buddhism since he was twenty (in 1996), he visited India and Nepal many times, and took courses with various teachers, including Geshe Tenzin Zopa. Miles says he had to write it, regardless of how many people would read it. Simply because he wants to convey his message - an alternative to quick, bite-sized forms of spirituality, which provides direction and depth. But of course he’s hoping many people will read it, if only because the proceeds have a special destination: Kopan Nunnery in Kathmandu (Nepal), one of the largest Buddhist women's monasteries in the world. That’s where he presented his book, in October this year. ‘For centuries, women could not pursue the full course to receive the equivalent of their doctorate in Buddhist studies - until the Dalai Lama insisted that nuns should have the same opportunities as monks. Many of the Kopan nuns have experienced unimaginable hardships – cultural genocide, displacement, poverty, and being orphaned. And yet they find the perseverance, grace, compassion and humor to keep pursuing their dreams, studying for twenty-five years to become Geshe-ma, or masters of Buddhist philosophy and practice.